Inception Group is a fun, creative and dynamic company founded in 2009 by entrepreneurs Charlie Gilkes and Duncan Stirling. The company operates a group of a unique bar, restaurant and club concepts in South West and central London. We open our first bar: ‘Barts’- London’s first speakeasy hidden within a Chelsea apartment block. It’s the height of the recession with 50 pubs a week closing in the UK and many would argue the worst possible time to launch, especially with no street presence at all! However, the opening generates a huge buzz, especially thanks to Twitter which has just launched. Barts quickly develops a loyal regular following. Maggie’s is born. We open a 1980s themed club on London’s Fulham Road, named after 80s icon, Maggie Thatcher. As ever our tongue is firmly in cheek as we set about launching a club playing exclusively 80s music with Rubik’s cube tables and extremely kitsch cocktails. There seem to be more 80s fanatics than we could have imagined which keeps Maggie’s bustling throughout the week. We felt Londoners were spoilt for choice when it came to fine dining options but there weren’t enough fun and lively alternatives. Our answer, Bunga Bunga- an Englishman’s Italian, somewhere you can eat, drink and be entertained under one roof from the early evening until the early morning. It’s our first restaurant opening and we spend months developing our pizza base and are delighted this receives critical acclaim within weeks of opening. Mr Fogg’s Residence is our first opening in central London, housed down a small back-street behind Berkeley Square in Mayfair. This eccentric bar packed full of Victorian memorabilia imagines the house of the fictional adventurer, Phileas Fogg. We develop a high-end cocktail led offering and a small snack menu. It’s great to see people walking back in time and embracing the concept. Cahoots, Soho’s new underground home, where the spirits are high and the drinks never run dry, launched on the eve of Thursday 5th March. What-ho! The venue recreates a post-war abandoned underground station, that was used as an air raid shelter during the Blitz. After the war, scoundrels made it their new home from home and features dazzling cocktails, swing dancing and sing-a-longs around an old piano. In mid-October we opened Mr Fogg’s Tavern in the heart of theatreland on St Martin’s Lane. A traditional Victorian tavern, which features period-authentic entertainment, alongside fantastic home brewed-ales, seasonal cocktails and hearty roasts. In October, we also opened Mr Fogg’s Gin Parlour. 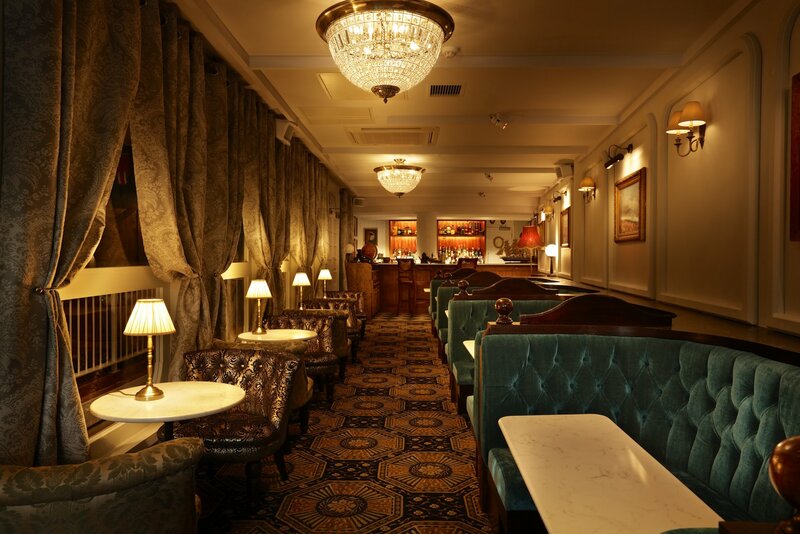 Located upstairs, the Gin Parlour houses a huge collection of gins, both well-known and rare. Serving delicious cocktails, fine wine and champagne, the parlour also plays host to its very own twist on the infamous Tipsy Tea -‘G&Tea’. In early October we continued expansion in Covent Garden opening BungaTINI on Drury Lane. Inspired by a neighborhood back-street Italian bar & pizzeria, BungaTINI serves a delicious range of home-made pastries, pizzas and classically simple regional dishes available to eat in or take away. Five years after the original in Battersea, we opened a far bigger and bolder version in the heart of theatreland offering a fully immersive dining experience. The underground lair of la famiglia Bunga, Bunga Bunga Covent Garden, is accessed only through the meat locker of BungaTINI. 2018 was the year of Fogg’s and it started with the first of three new Fogg’s sites – Mr Fogg’s House of Botanicals. Located right in the heart of Fitzrovia, the House of Botanicals is light and airy, filled with flora and fauna collected from Fogg’s travels, as well as featuring a botanically-inspired menu. One month later – not a stone’s throw away from Charing Cross station – another Mr Fogg’s opened. Mr Fogg’s Society of Exploration boasts wood-panelled walls, warm leather seating and shelves laden with eccentric artefacts. Inside, you’ll find the Map Room, a place for explorers to share tales of their travels and plan future endeavours. Next to it sits the Orient Express, a life-size model of a Victorian train carriage complete with brass lamps and windows overlooking the bar area. With quirky areas and a beautiful marble-fitted bar, it’s an excellent addition to the Fogg’s Collection. ur biggest Fogg’s venue yet, Mrs Fogg’s is located in the heart of the City and pulls inspiration from Mr Fogg’s better half – his Indian wife, Aouda. With decor inspired by India, as well as a life-size version of the Rangoon Steamer, there is no shortage of incredible spaces for you and your guests to enjoy. The Steamer – which seats up to 40 passengers – is complete with opulent curtains, plush velvet seating and grand chandeliers. Alternatively, gather in the Maritime Club – a sophisticated, elegant area featuring both nautical and Indian decorative touches.